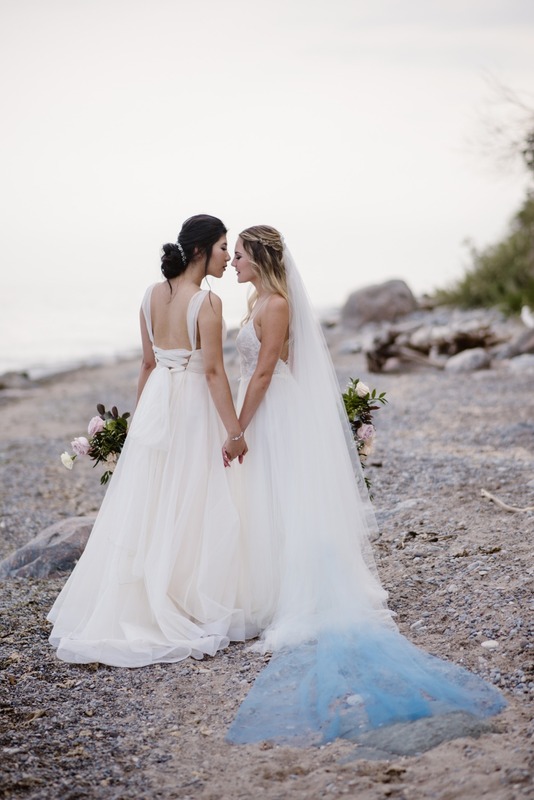 The seaside cliffs at East Point Park in Toronto were the inspiration behind this romantic elopement shoot for the future Mrs. and Mrs. 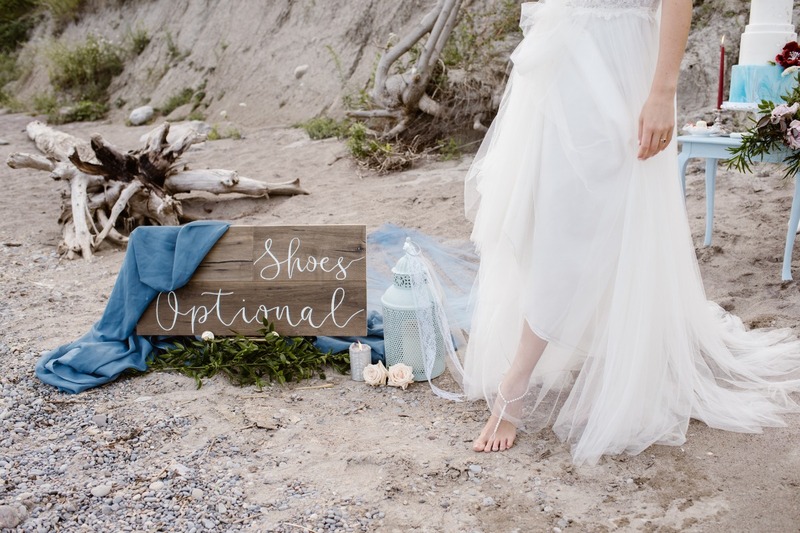 Champagne & Cedar teamed up with photographer, Khristel Studios and a whole crew of vendors with one idea in mind: create a romantic elopement on the beach that would appeal to every couple. 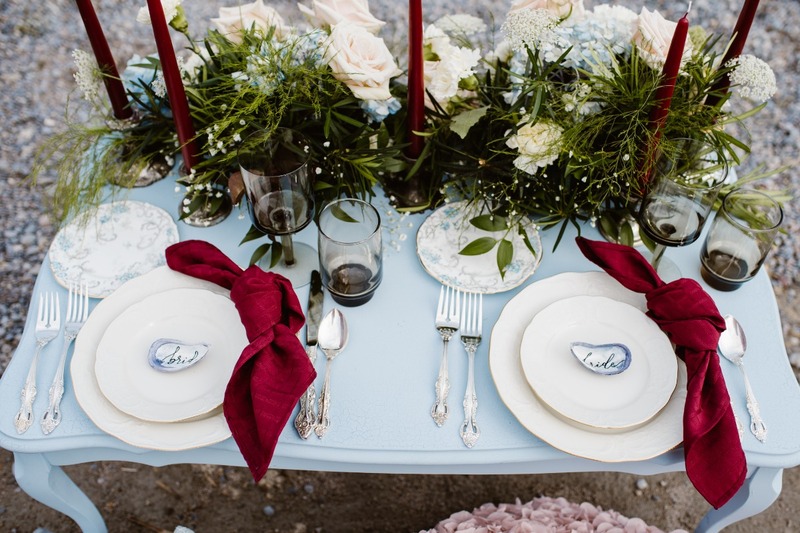 Of course, they achieved all that and more with this intimate elopement by the sea brimming with hues of burgundy, blue and silver accents throughout. 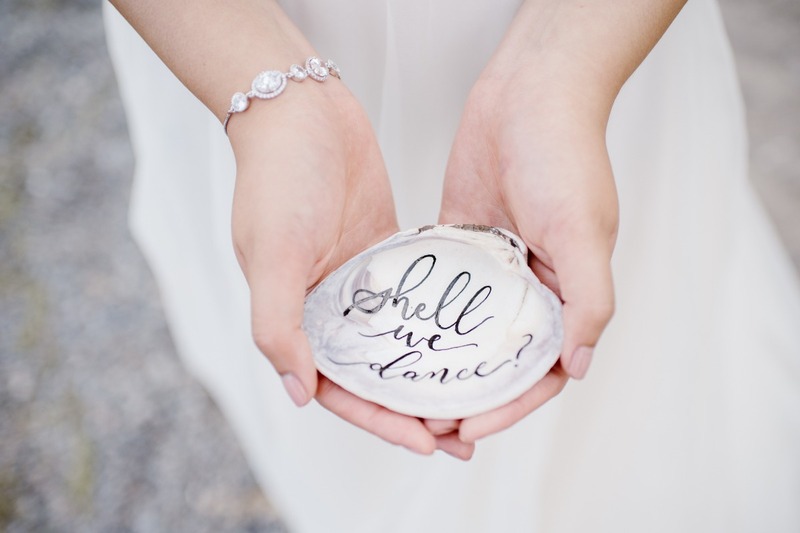 Dive right in, and don’t be afraid to get your toes in the sand with all the details you’re about to see. When you’re ready for more, don’t miss out on the full gallery. 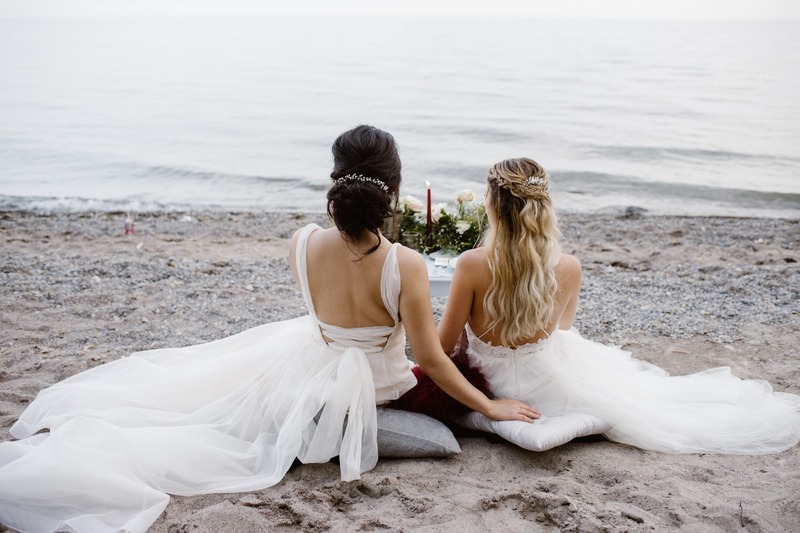 From Khristel Studios: In this elopement style shoot Rebecca from Champagne & Cedar and Khristel from Khristel Studios team up to create a dreamy, relaxed, and romantic atmosphere for couples, including the LGBTQ community. 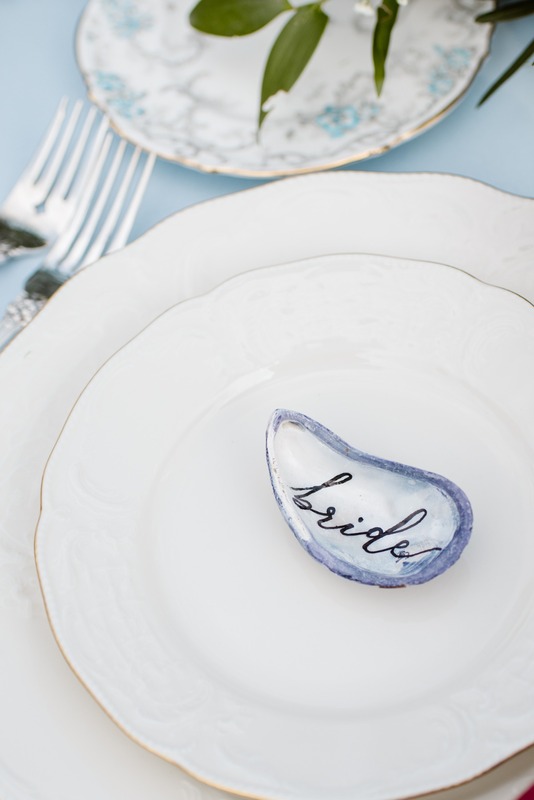 The soft hues of the natural beach helped to achieve this mood by providing the perfect setting for a stunning elopement. 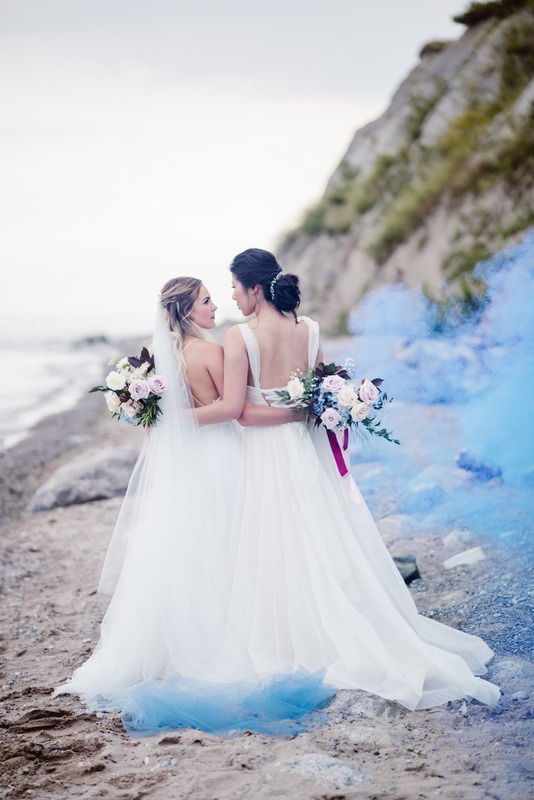 It was important that each bride complement each other but still have their own sense of style; hair and makeup by The Beauty Movement helped achieve this. 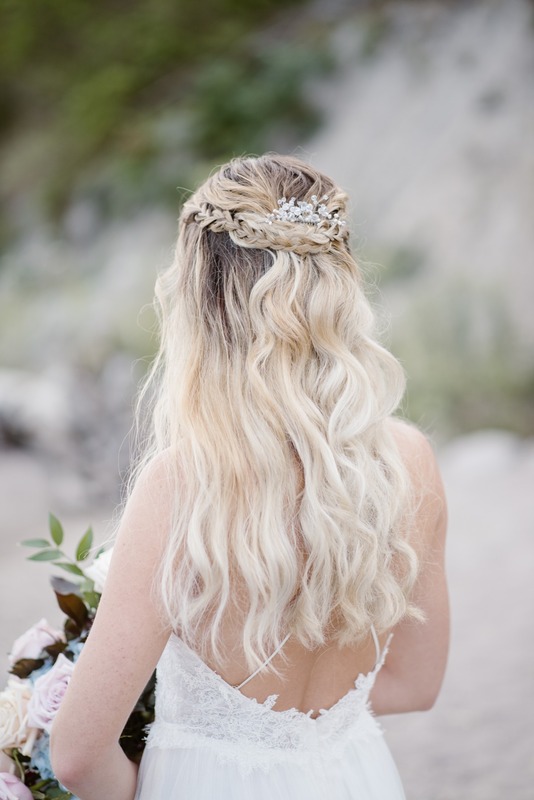 We kept both brides looking soft and effortless but gave them their own makeup hues and hair styles. 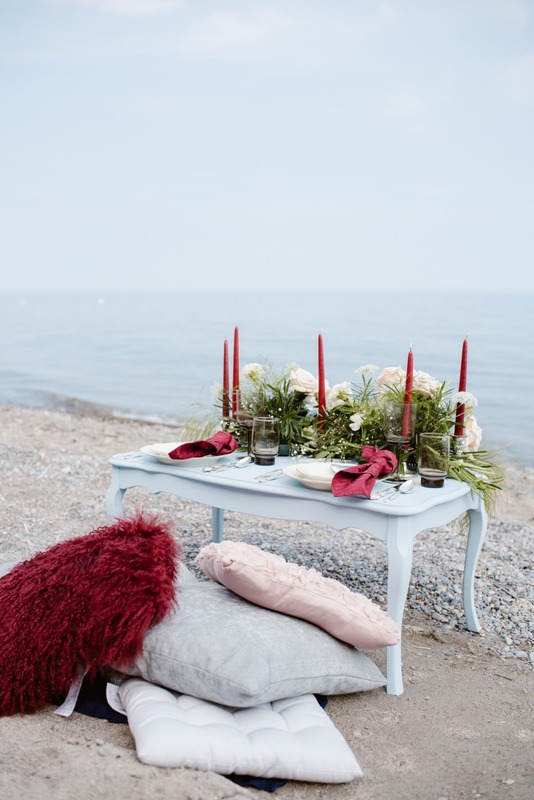 The sublime East Point Park in Toronto became our backdrop for this romantic shoot. 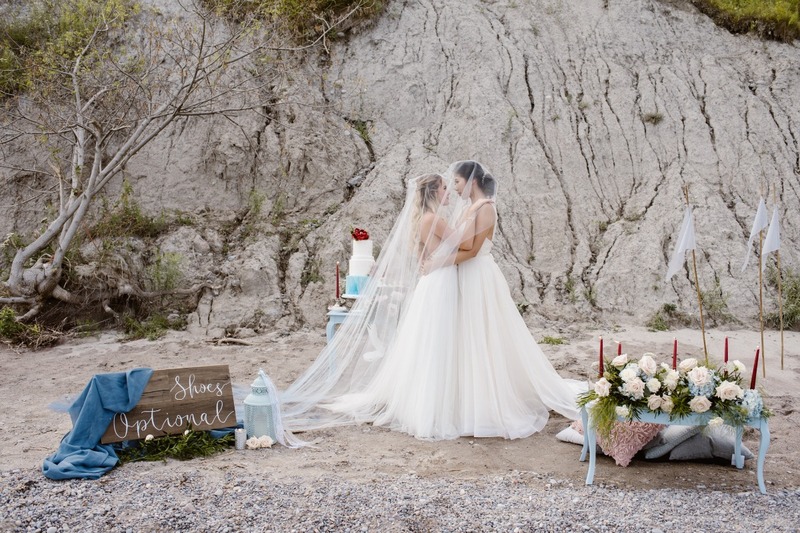 The beautiful cliffs and soft beach tones gave us plenty of organic textures to incorporate. 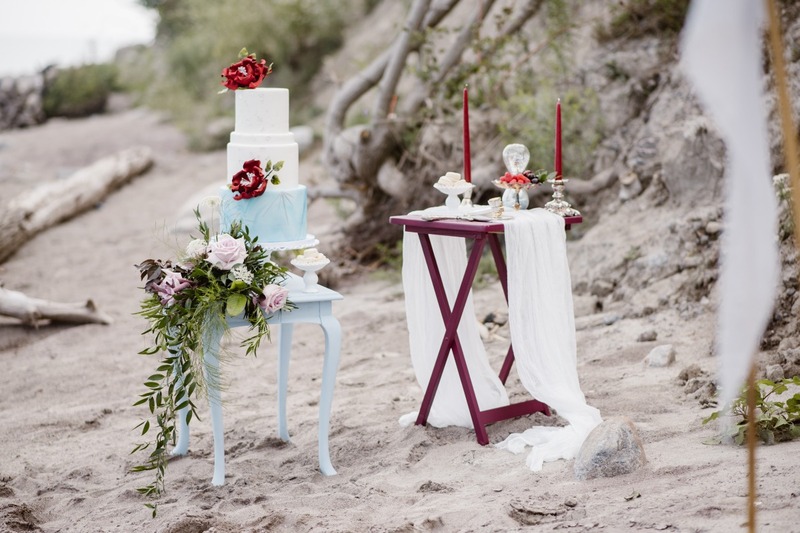 We love the sand and how the soft fabrics of the dresses and decor flow in the wind. 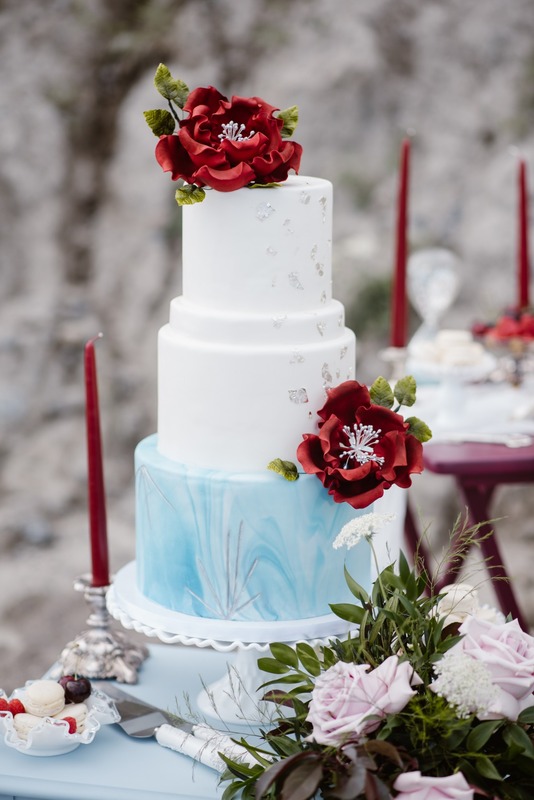 The rocks from the cliffs also allowed us to easily incorporate the burgundy hues within the florals and other decor accents. 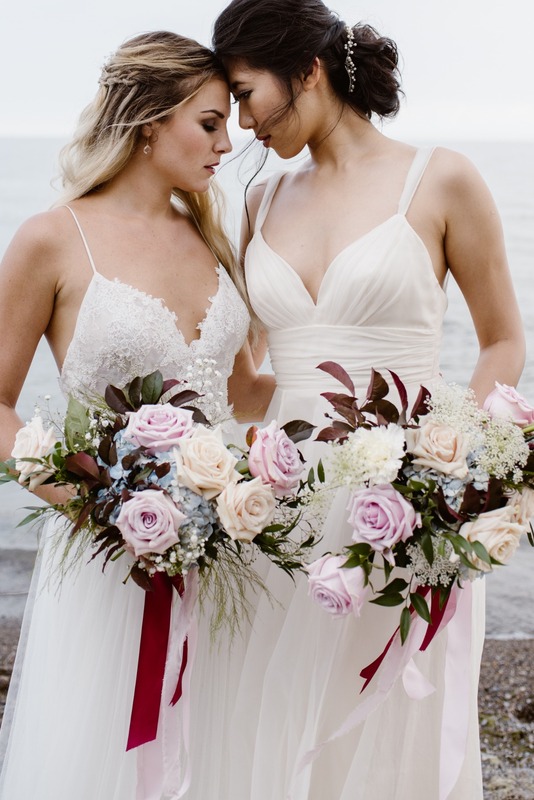 The bouquets from Fairy Florals are loose and unstructured, with added touches of Queen Anne’s Lace and Asparagus Fern that truly capture the natural and organic feeling we were going for while still maintaining a sense of elegance. 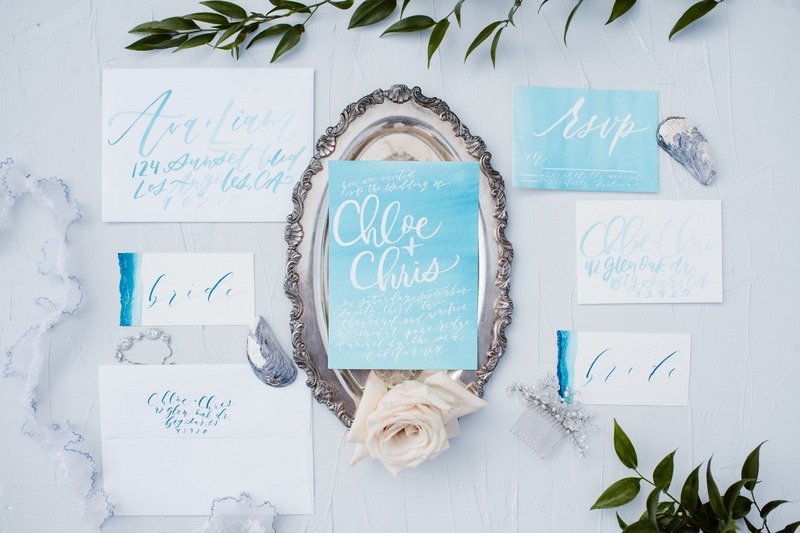 The ocean inspired calligraphy suite of Alicia Spence Design, the mixed vintage table top setting from The Perfect Table, and the stunning wedding cake from Kiwi’s Cupcakes & Cakes, were created with the waves of the ocean in mind and with the purpose of inspiring couples thinking of their own beach wedding.